MediMove was created to provide facilities a solution to improve decision-making, communication and patient flow. This will organize and enhance the clinical exchange between emergency and hospital medicine physicians by using automation to manage information and a structured course. 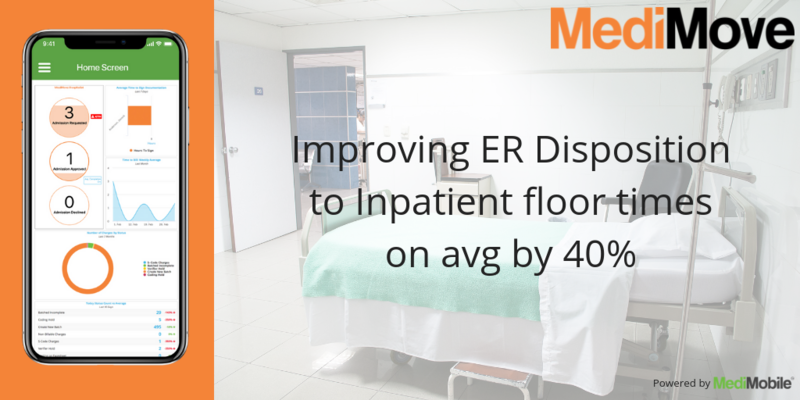 MediMove reduces human errors, delays, and distractions that occur in most hospital’s throughput process. The software manages calling, tracking, and follow-up so that the providers can focus on patient care. It provides clinical notes, lab results, etc. to improve the reporting when discussing patients that need further evaluation or potential admissions. The ER provider or Scribe initiates MediMove when a patient needs further evaluation. The software notifies (telephonic technology to page, text or call) the admitting provider and displays clinical and patient demographic information (via iPhone, droid or web based) to improve and expedite the decision making approach. The Hospitalist discusses the patient with the ER provider and if the Hospitalist provider wants to admit the patient, he/she would accept within MediMove and the software would then notify bed control/house supervisor to assign a bed. Once the bed is assigned in the facilities bed management system, it would send a message via HL7 feedback to the Hospitalist, notifying he/she that the patient has been assigned to a specific room. MediMove provides Hospital management and Physician Management teams Real-Time throughput KPI’s. The software time stamps specifically who touches the patient through the streamline process and highlights bottlenecks. Reports show daily and hourly trends that can provide data to improve the procedure for future admissions. We have created a more efficient admission process, which in turn increases inpatient and ER volumes, reduces Left Without Being Seen (LWBS) rates, and reduces the amount of time and effort of the provider to move patients to the inpatient floor. The automation decreases the resource time, reduces phones calls to providers and improves timeliness of patient movement to the floor. This system will truly integrate the ER and HM groups with the common goal of providing the best patient experience and outcome.